Designed and manufactured exclusively by U.S. Orthotics, the Diambondback" Plastic Insert Corset, featuring a large pocket to accommodate a thermoplastic insert, offers a variety of options tailored to your patients' needs. Eight-inch, ten-inch, and 12-inch back heights provide anatomical form and function. It's these types of options that have made U.S. Orthotics one of the industry leaders in design, manufacturing, and servicing of orthopedic products. Preferred by those who provide the best care for their patients, U.S. Orthotics products are competitively priced, with top-notch service. Made in the U.S.A. The BraceLink" Pocket PC concept was originally introduced in January 2002 and was sold as a software/hardware package. However, since many O&P professionals now have their own Pocket PCs, Orthomerica® has launched the new, improved Version 2 BraceLink software by itself. BraceLink v.2 software is designed to assist the O&P professional with patient and office management tools. BraceLink v.2 makes ordering custom orthoses easier, more accurate, and paperless! Users can draw, photograph, and voice-record notes for secure patient files or custom orders, in addition to referencing L-Codes, scheduling appointments, writing notes, and composing emails. BraceLink v.2 software costs only $199. Designed for every activity level and lifestyle, the new Cadence HP" foot from Seattle Systems Inc. has a patented C-shape construction which eliminates awkward upward propulsion, unlike competitor designs with "J" styling. The Cadence HP design brings the toe down quickly without the accompanying "slap" which can occur in other designs when the toe comes down too quickly after the amputee steps upon the heel. The Cadence HP is great for hiking and walking on uneven terrain and is rated for amputees weighing up to 350 lbs. 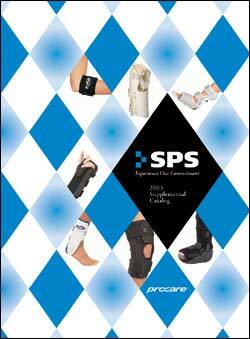 SPS has begun distribution of the complete line of ProCare" products from dj Orthopedics. Reddie Knee Brace--1/8" neoprene wraparound configuration and strap tabs provide ease of application. ComfortFORM" Wrist Support--Ideal for sprains, strains, and control of carpal tunnel syndrome symptoms. ProROM" Walker--Recommended following Achilles tendon repair, stable fractures of the lower leg and ankle, acute ankle sprains, and soft tissue injury. ElbowRANGER® Motion Control Splint--For non-operative application, collateral ligament strains, and ruptures, and ulnar nerve transposition. May be used following early cast removal to stabilize fractures and for post-operative immobilization. Another innovative prosthetic knee from Medipro® of Germany--the OP4--is immediately available. 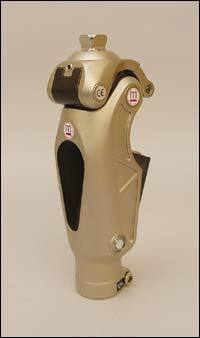 Improving upon the design of the popular OP3 knee, the OP4 is a single-axis pneumatic weight-activated locking knee. The OP4 provides the same pneumatic swing phase control in a single-axis design of the OP3, but in a new, lighter material. The streamlined design couples the attributes of safety and stability with the fluid motion and smooth gait produced by a pneumatically controlled knee. Although it weighs only 635 grams (1.4 lbs. ), the OP4 is strong enough for community ambulators weighing up to 220 lbs. SKINERGY", the new standard in affordable lower limb silicone cosmesis, is in stock in SPS' Atlanta warehouse and available for SAME-DAY SHIPPING through SPS. The manufacturer, RSLSteeper, has employed new innovations in silicone polymer technology to significantly improve appearance and durability versus other protective coverings. Micro detail texturing and nail finish provides a natural look. While providing increased tear resistance, the cosmesis will stretch more than 25 percent to ease finishing of varying heel heights and bulbous residual limbs. 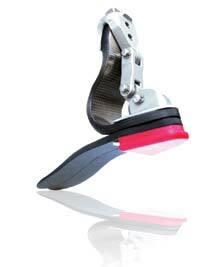 It is suitable for all Symes, partial foot prostheses, and Seattle Feet. SKINERGY silicone cosmeses may be reimbursed under Protective Coverings L-Code 5964 for AK applications and L-Code L-5962 for BK applications. Polhemus, a leader in 6 Degree of Freedom (DOF) motion capture, tracking, and digitizing technologies, announces the new Liberty" Series DOF tracking product line. Liberty has speed (240 Hz per sensor), ease of use via an intuitive graphical user interface (GUI), scalability, and improved signal-to-noise-ratios which increase stability and resolution while providing consistent high-quality data. The GUI allows four independent user-definable profiles for setting system parameters, a valuable feature for multiple applications or users. 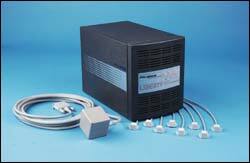 products to meet various tracking requirements and budget constraints. Comfort Products now manufactures PVA bags. After an extensive investment and quality program, we have overcome the industry-wide product reliability problem formerly associated with this product line. 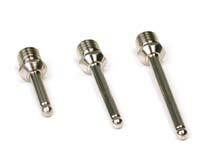 The product comes in 2" tapered end openings, in a variety of widths and lengths, 20 bags to the package. Custom sizes may be specialty ordered. PVA bags are competitively priced and in stock for immediate delivery. It’s Slick and It Clicks! The Gator Grip, Fillauer's all-conditions prosthetic lock, has a new pin. Not taking the place of the Flexible pin but just another addition to the Gator Grip line, Fillauer introduces the Smooth Rigid Pin in three sizes, 1', 1-1/2", 2". The audible feedback, which allows the customer to hear the pin click upon engaging with the lock. The posi-lock, which means however far the pin is engaged it is locked on. The smooth surface, which prevents socks from getting wedged under serrations, and the smooth surface allows the lock to grip in small or big increments. The new Amfit® 4.0 Windows-based software provides complete ease of operation. The open design of the improved Footfax"-SL 3D Contact Digitizer allows easy placement of the foot for corrected alignment in full-, semi- or non-weight bearing positions. The unique contact sensor array posts both soft tissues and bony structures and accurately records precise elevations. The 3D foot cast is displayed in 2D and 3D images and stored for further modifications with Amfit's new 4.0 "Correct & Confirm"" software--eliminating your need to modify plaster casts! 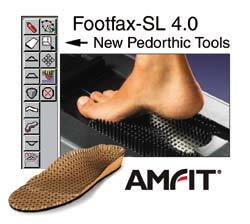 Included is the Amfit Custom Shape Library, allowing custom-designed modifications to be saved and automatically positioned and scaled on any digital foot-file.